Lauki (Bottle Gourd) is one of the most loved vegetables during the summer season. Though it is a common vegetable in our kitchen, loved by some, and hated by many but, it has excellent nutritional benefits also. Lauki contains essential vitamins and minerals like vitamin C, vitamin B, vitamin K, vitamin A, vitamin E, iron, folate, potassium, and manganese. Truweight’s Lauki ki sabzi recipe is a tasty Indian dish, made with spices, and tomatoes. This delicious, healthy preparation of lauki ki sabzi can be eaten with rice and roti as well. Try this recipe today! Take oil in a pressure cooker and add cumin seeds, chilli powder, turmeric powder, asafoetida, ginger and green chilli. Saute them. Add bay leaf, lauki, tomato, some salt to it and saute them further. Add required amount of water and cook it for 5 whistles. Add lemon juice and coriander leaves. Mix them thoroughly. 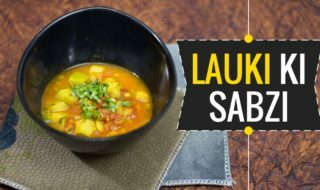 You can now serve your delicious lauki ki sabzi.